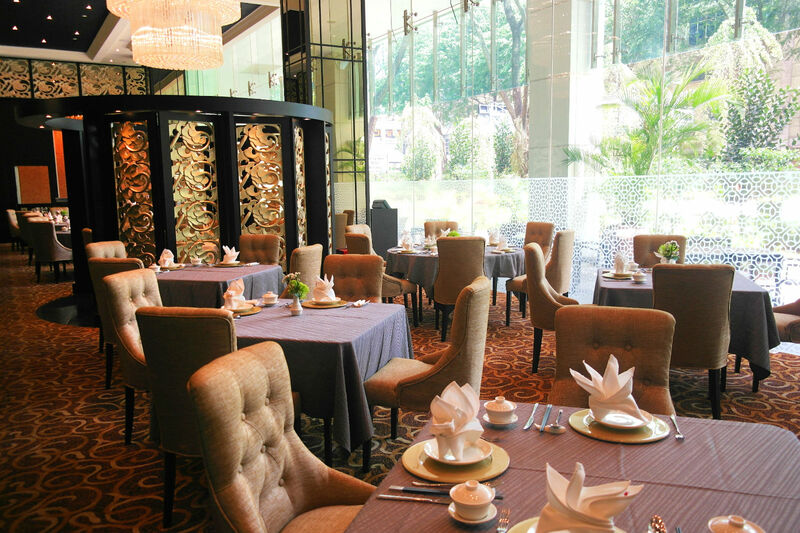 Royal Pavilion is a new 142-seater Cantonese fine-dining restaurant helmed by Executive Chef Chung Ho Shi, and tastes as good as it looks. 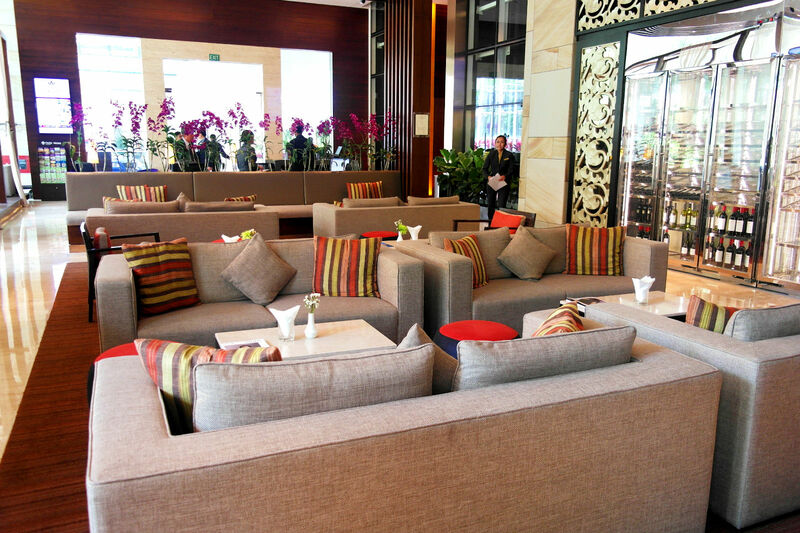 The interior is designed by award winning designers, as well as featuring a grand chandelier; something not usually seen in a Chinese restaurant. 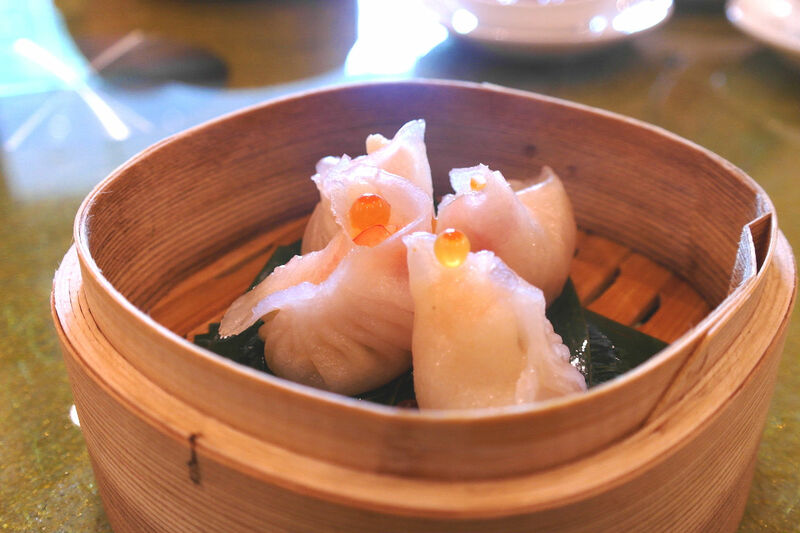 A combination of classic Cantonese dishes with a more contemporary style, the setting is very comfortable and suitable for corporate lunches or dinners. Daily made, fresh dim sum is also going to be part of the tasting menu today along with chef’s tribute to Cantonese soups, poultry and use of fresh seafood. Baked Swiss BBQ snow bun ($5.50). Crispy exterior with char siew filing that’s not overly sweet. A smaller size also do you don’t feel overly full trying to finish it. Steamed Diced Vegetables dumping ($4.50). 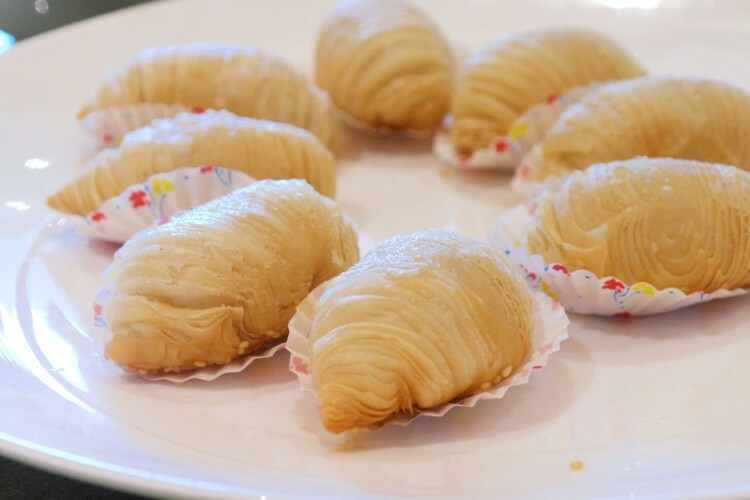 Stuffed full of vegetables like carrots, radish and mushroom, the skin is also quite light but bites open easily for the ingredients to shine. Carrot Cake with ‘Lao Gan Die’ Chili Sauce ($8.80). Usually made with XO chili sauce, Royal Pavilion uses a ‘Lao Gan Die’ chili sauce which is quite similar, but different. To be honest I’m not quite sure what the difference is, which is a recipe secret by Chef Chung. Good texture on the carrot cake though and not overly starchy or soggy. 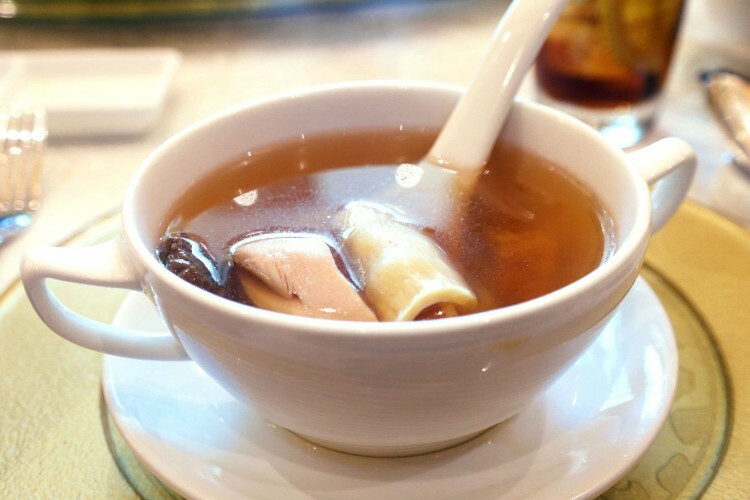 Double-boiled Chicken Soup with Fish Maw and Macalan ($25). What better homage to Cantonese cuisine than chicken soup? Comes in a large bowl instead of this serving size, so don’t be too alarmed at the price. They use Macalan root to add flavour to this tasty soup, a Chinese herb which is also a aphrodisiac, ho ho. Steamed Shrimp Crystal Dumpling ($4.80). 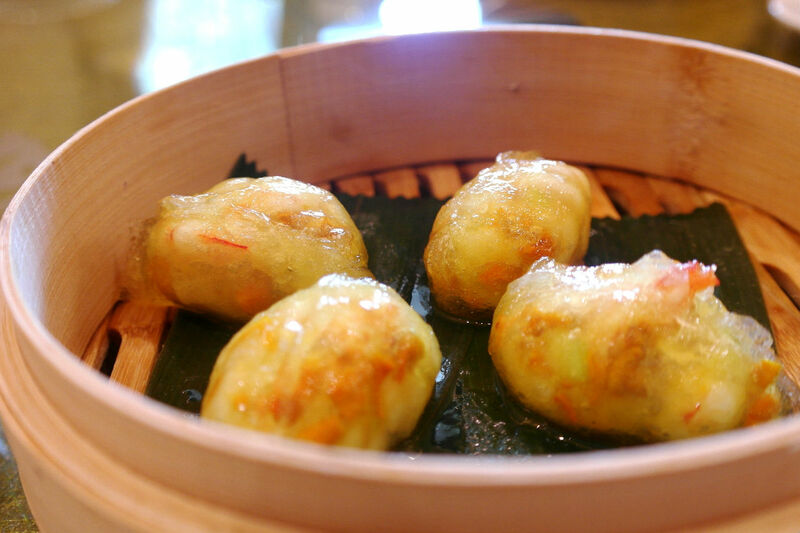 Whole fresh prawn is used with finely chopped vegetables, encased in this translucent yet firm skin. 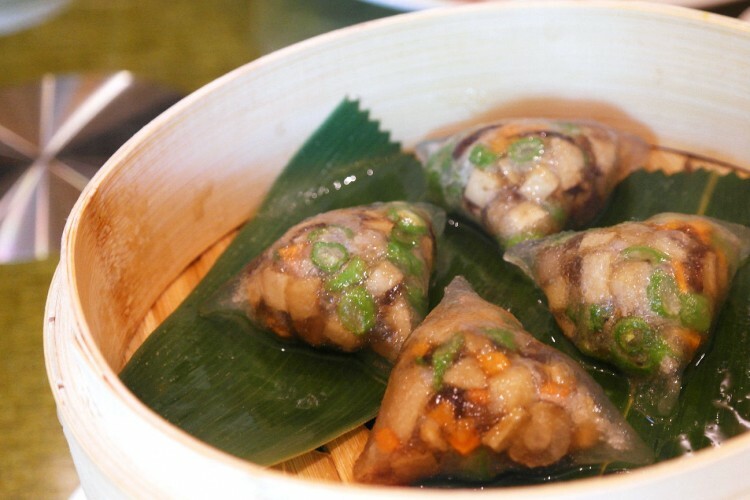 Steamed Prawn Dumpling “Ha Kau” ($5.80). Topped with Ikura salmon roe for a bit more fish flavour, I preferred the Crystal dumpling above though, which has similar flavours. 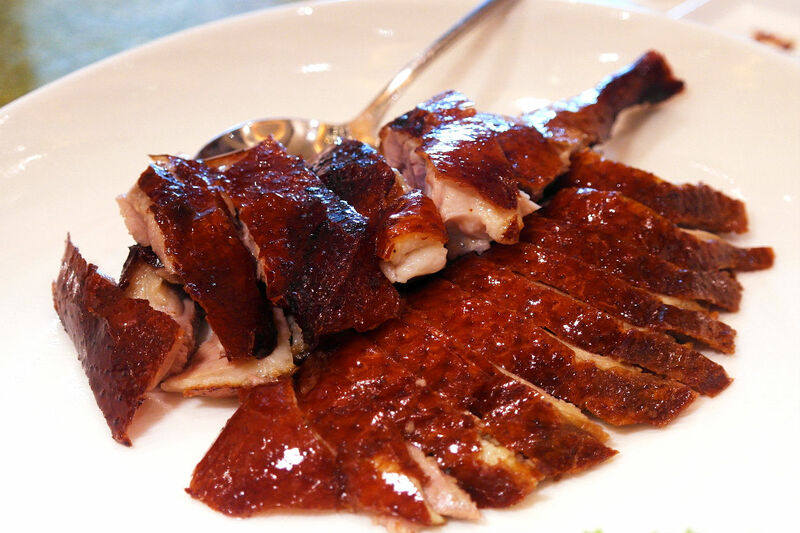 Royal Smoked Duck ($35/$68). 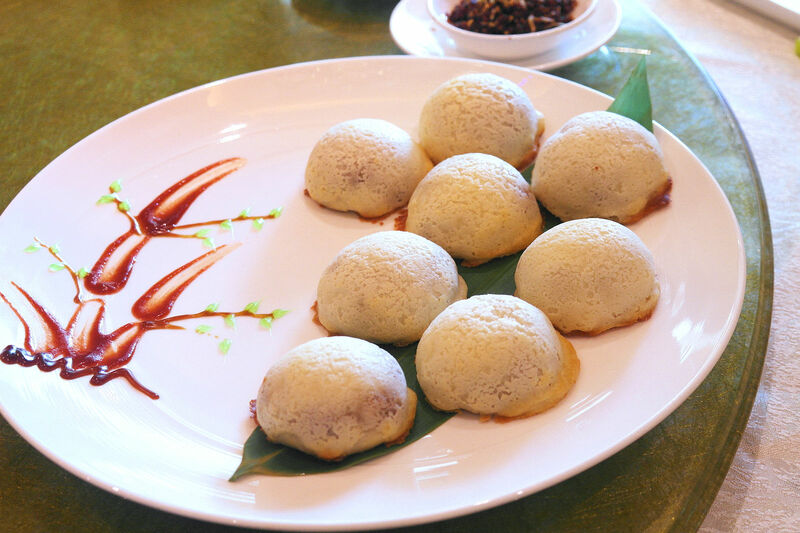 Flavored with lychee tea leaves and smoked over chipped wood, plum paste also accompanies this signature dish on the side. Very tender with a roasted skin finish, this is definitely something you will want to try. Sauteed Seafood Duo Skewer with Crab Meat and Roe ($14). 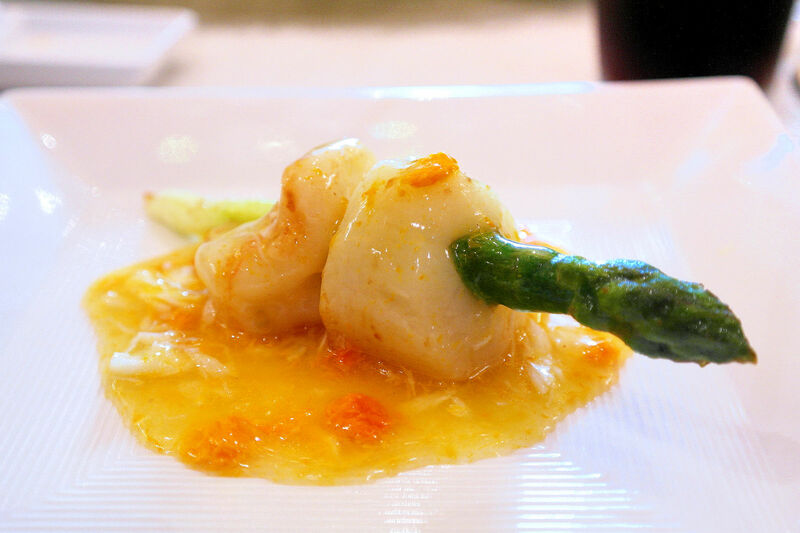 Skewered by an asparagus, this dish has prawn and scallop along with crab meat roe sauce, 3 of my top seafood favorites. Asparagus adds that bit of ‘freshness’ to blend with the heavy seafood flavours, as well as add a crunch texture. Lovely crab meat roe sauce to complete the wholistic savoury experience and make the dish more full. 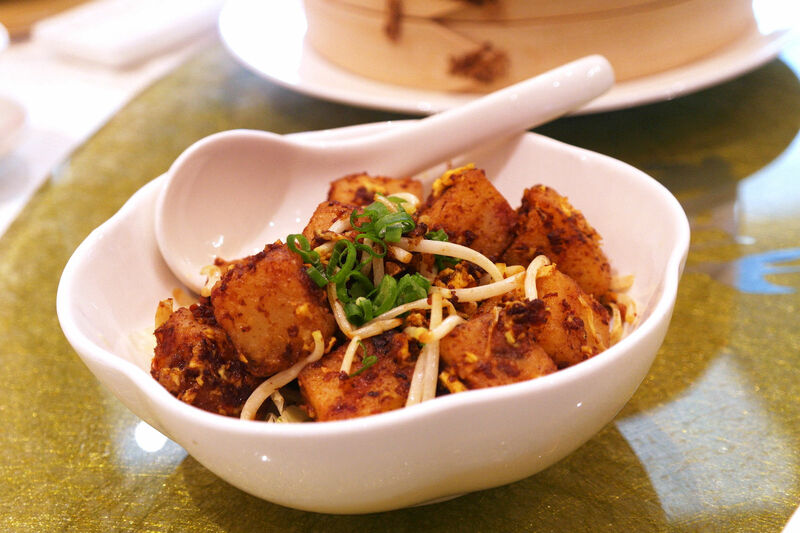 Wok-fried Mashed Fish Noodle with Lobster in ‘Lao Gan Die’ Sauce ($28). The noodles are truly unique, handmade with fish with a bouncy texture like fish balls, but in a stringy noodle form. 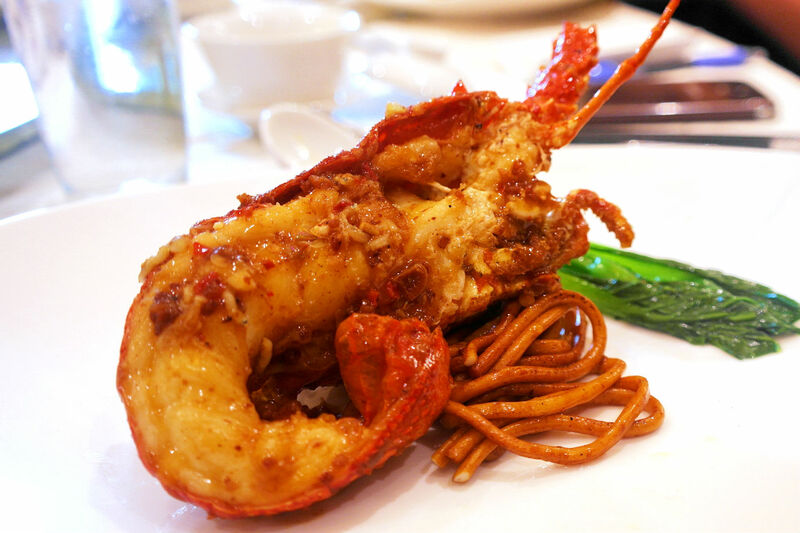 Mildly spiced ‘Lao gan die’ chili sauce also flavours this dish and ties the lobster and noodles together. 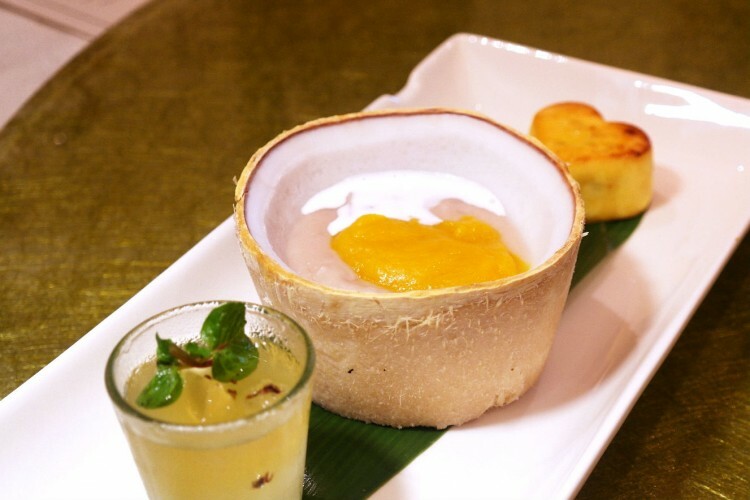 From left: Lime Lemonade with Aloe Vera and Lemongrass Jelly ($6), Steamed Mashed Taro with Pumpkin Puree ($8.50), Special Walnut Pastry ($3.80/pc). The lemongrass jelly was also plum flavoured with refreshing mint- really a pleasant palate cleanser to the meal. The mashed taro ‘or ni’ was heavier in comparison but had very nice soft coconut flesh that you could spoon out, along with pumpkin for a bite more sweetness. Walnut pastry had large walnut chunks but isn’t something I’d order for dessert. Just a note, the desserts above are all in serving portions and are bigger in real life because if we ate the real portion, we’d all be fat. Located in the swanky Park Regis, Royal Pavilion Cantonese Restaurant is actually pretty competitively priced especially for its dim sum. The comfy chairs and pleasing decor all serve a very classy atmosphere and would please many business clients looking for private rooms as well, of which they have 6 of.